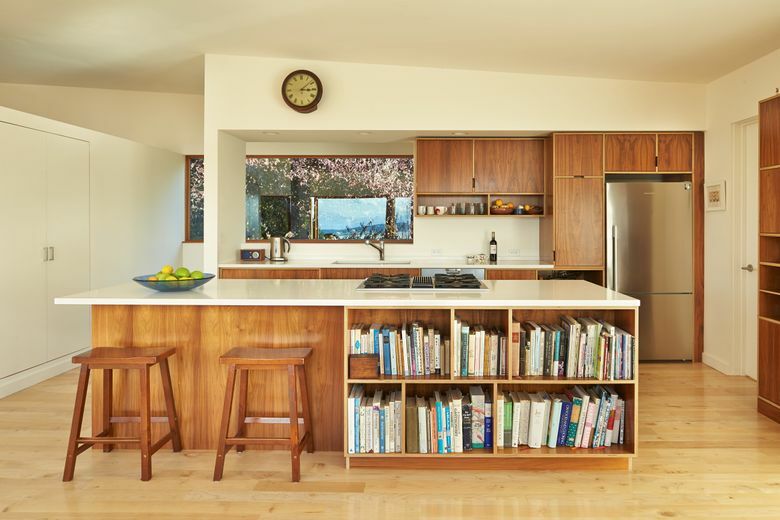 This home of light and views, designed by architect Chris Serra, was built on a supertight budget. 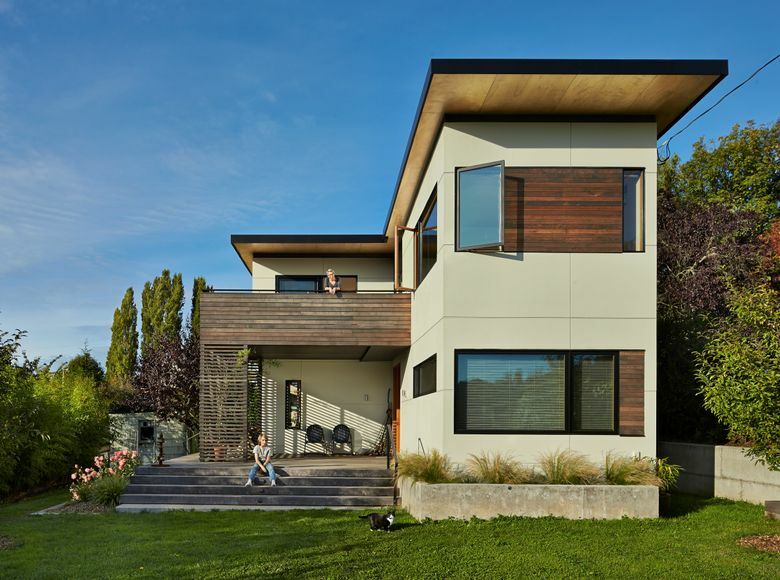 JULIA KUSKIN and Joel Bell adore their bright new contemporary home in the Sunset Hill neighborhood of Ballard. Working with what they call an “aggressive” budget, they consider themselves fortunate to find No. 1: an affordable teardown in the neighborhood and, No. 2: an architect who looked upon the challenges of their project as opportunities. It’s Finn that’s the problem. “He went in and kicked their cat out,” Kuskin says of the new owners. Though Finn is, apparently, still fond of the old place, his owners were well ready to move on. “We were looking for a larger house,” Kuskin says. “Not more square footage,” Bell clarifies. Joel Bell is a psychotherapist and musician (formerly lead singer for the L.A. rock band Mrs. God). He needed a sound-tight room for his keyboards, Hammond M3, the upright Steinway, recording boards and various other instruments of rhythm and tune. Also their son Ian’s drum kit. Kuskin is a photographer and graphic designer. She required her own space to think and create. And each of them wanted as much Northwest light as could be coaxed indoors. This is a compliment and it is intended for their architect, Chris Serra of Bjarko Serra Architects. Serra was undaunted by the skintight budget, building constrictions and the desire for an “introverted, quieter, not showy” contemporary. The architect was unafraid to, ah-hem, go toward the light. 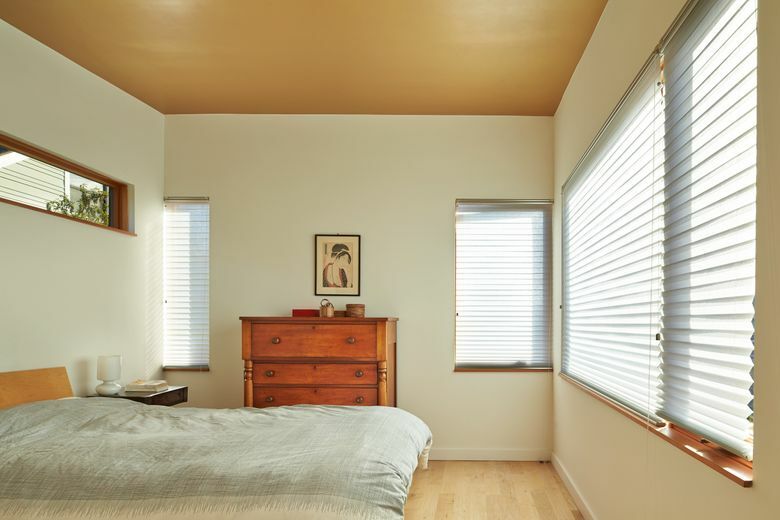 He responded with a 2,100-square-foot box (two bedrooms, two baths) with the main living spaces on a second floor lined with big windows. A deck off the kitchen offers outside dining with sun and views. 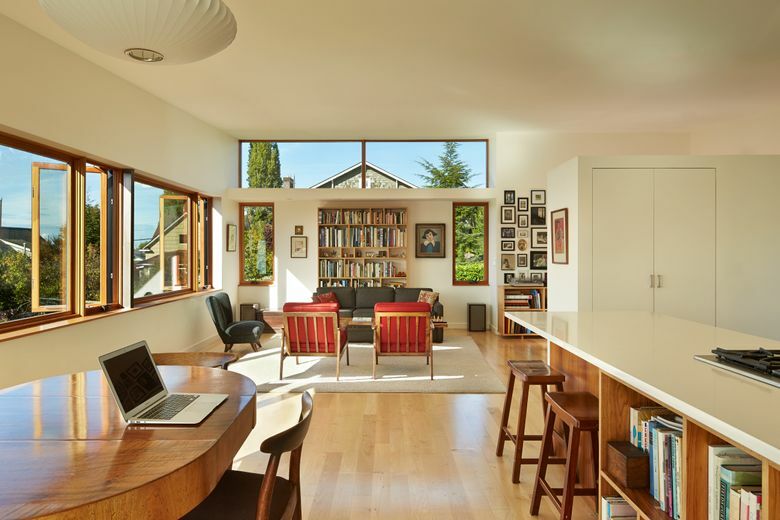 Clerestory windows usher in diffused light. 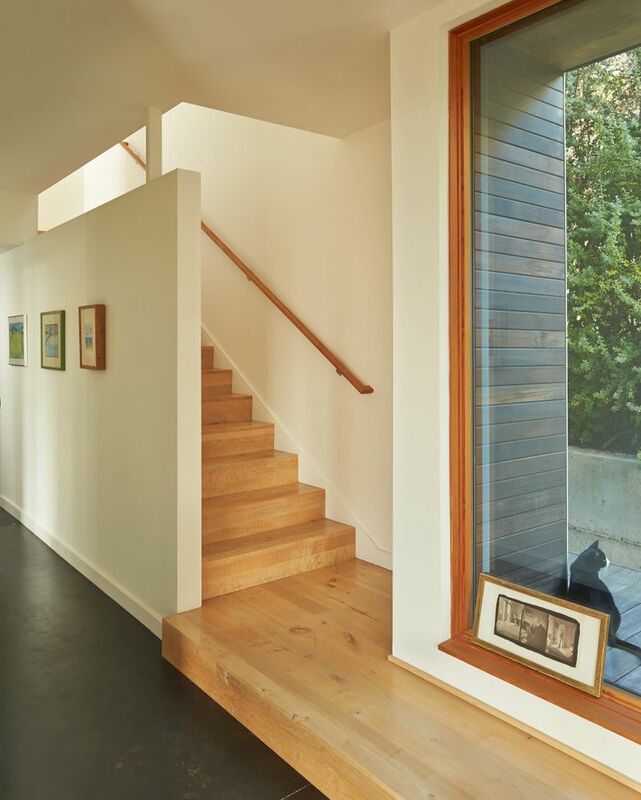 The open stairwell, on the eastern edge of the house, also has a large window. This brings in soft morning light and, believe it or not, also serves as a kitchen window (the view to a lush plum tree). Offices and Ian’s bedroom are downstairs. They too, are bathed in light. Most passers-by on this street of cottages, bungalows and the occasional Tudor notice only a tall streetside horizontal fence. The white contemporary behind it sits far off the street, 55 feet back, in accordance with covenants that came with the property. That’s fine with Kuskin and Bell — their new home sitting where the old once was, blocking no views (Sunset Hill’s crowning feature) and providing them with a country-sized front yard. There were two items on which Bell and Kuskin would not scrimp. 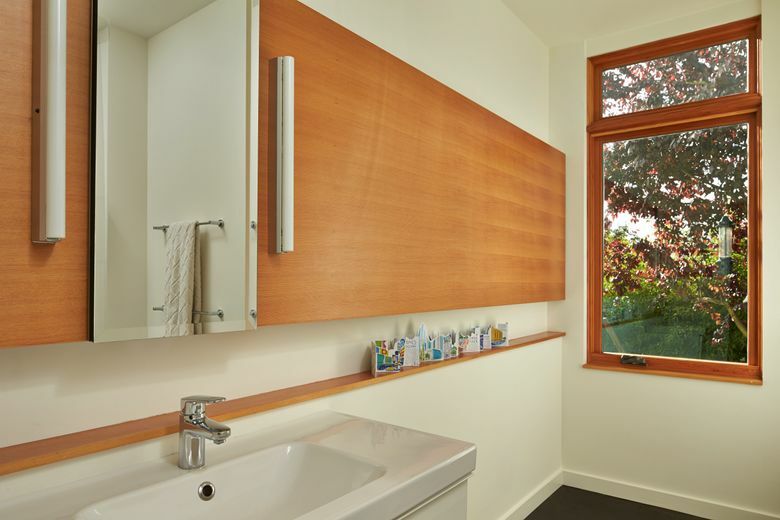 The windows (aluminum-clad wood with a fir interior from Sierra Pacific); and cabinetry and built-ins from Kerf Design. “The joke goes . . . ” Kuskin says, looking nervous again. “That 30 feet of vinyl windows would cause erectile dysfunction,” says her husband.